Based on the hit anime Naruto this free to play browser-based MMORPG lets you visit the locations seen in the show and meet the cast you know and love. Gallo companions and pets and adventure across the land taking on quests in your journey to become a martial arts master. The first quests players complete will unlock the ability to choose a genre to focus in for their chosen martial art; Taijutsu, Ninjutsu and Genjutsu, each having their own strengths and weaknesses when going up against each other. Where Ninjutsu fighters may have an increased critical strike damage this is counterbalanced by the Taijutsu practitioners increased chance to block and reduce damage and the Genjutsu fighters ability to dodge damage altogether. Questing is one of the key features that is used to unlock a number of the other key elements within the game, by completing quests and advancing in level new features become available to players and earning gear and items along the way. The quests themselves are story driven and are automatically triggered when the player reaches a certain condition point (meaning it is not necessary to talk to NPC’s to gain quests). 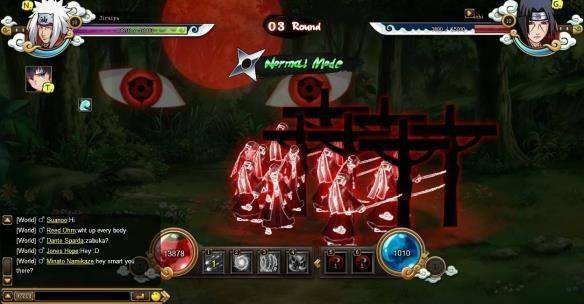 Whilst players advance in level they are able to unlock the eight gates, stat boosting waypoints that are unlocked every level, each of the eight gates enables a player to boost a specific stats or ability of their choice. To boost their abilities players must deposit spar crystals which are converted into energy and fill up a gauge, the higher rank a spar has the more energy is obtained. This other features within the game available to players are the collectable spiritual beasts which are unlocked at various levels and can be summoned into combat to boost your abilities, the boosts that they give is also determined by their level. Players can run a farm where they can grow Summoning Fruit that can help upgrade the Spiritual Beasts making them more useful in battle. Players can fight each other in the arena in various modes to increase their battle rank, unlock new titles and gain rewards for PVP and daily bounty missions.